Rui was very nice and extremely helpful. He is knowledgeable about Lisbon and its history. I have found, however, that guides are best when they find a thread of a story that they use to traslate history. Rui had all of the dates and events - but not the story. English was excellent. My wife was ill so it was just Rui and me. It was a long walking tour but covered a lot of ground. The Maritime Museum was fascinating. Rui was a great guide and very knowledgable. This was a great tour, we appreciated Rui's flexibility, insight and willingness to brace the pouring rain. We learned so much and we had a fabulous time. We highly recommend Rui. Excellent. Very proud of his city and extremely knowledgeable on national historical periods as well as current political trends. His English is nearly flawless. A most enjoyable tour. One tip: have him meet you at your hotel; we wasted time trying to find his suggested meeting point in the city. Thanks Rui! It was a pleasure to have a tour with you. A lot of interesting facts and details, nice atmosphere and everything very well organized! We have been on many tours in many cities and Rui is hands down the best! He is so knowledgeable, accommodating and speaks English fluently. We would highly recommend using his services!!! TOUR GUIDE RESPONSE: Dear Lori, Thank you for reviewing my walking tour. I am thrilled you considered it to be unparalleled and I appreciate the praise. Warmest Regards, Rui F.
I highly recommend Rui for a walking tour of Lisbon. Rui was a delight. He showed us parts of Lisbon that were off the beaten track as well as the typical must sees. He was flexible with our schedule and helped us plan a last minute trip to Sinatra. TOUR GUIDE RESPONSE: Dear Katharine, I would like to thank you for sharing your experience on my walking tour. And I am happy my recommendations on Sintra were helpful. Warmest Regards, Rui F.
Rui spoke excellent English. He communicated a thorough knowledge of history, architecture, politics, social demographics and economics. It was a pleasure hearing him answer our many and diverse questions. I would happily recommend Rui to friends and other travelers to Lisbon. TOUR GUIDE RESPONSE: Dear Robyn, Thank you for sharing your thoughts on my walking tour. I am thrilled you considered it to be informative and I hope to host you again in the future. Warmest Regards, Rui F.
We had such a wonderful time touring Lisbon with Rui. His knowledge of the city and the country and its history was amazing and made the tour fascinating. His added knowledge of America and its history made for a great conversation on topics of both past and current. At the end of the tour he recommended a lunch spot that was a great place away from the crowds and had the local feel in both atmosphere and menu. TOUR GUIDE RESPONSE: Dear Mark, Thank you for your review of my tour. I am thrilled you enjoyed the experience and the lunch recommendation. Warmest Regards, Rui F.
TOUR GUIDE RESPONSE: Dear Paul, Thank you for sharing your thoughts on the Slave Trade Historical Tour. I am thrilled that you considered the experience to be informative and eye opening. Warmest Regards, Rui F.
We had booked a full day tour and wanted to change the itinerary with little notice. Rui modified this and rearranged the tour. He was very knowledgeable and passionate about what he was showing us. He made a recommendation for dinner that was fabulous. I will strongly recommend Rui as a a guide. TOUR GUIDE RESPONSE: Dear Barbara, Thank you for sharing your feedback on my tour. It was a pleasure to host you and your group of friends and I am glad you enjoyed my dinner recommendation. Warmest Regards, Rui F.
Rui did a very nice job. He was friendly and knowledgeable. We would highly recommend him! TOUR GUIDE RESPONSE: Dear Jeffrey, Thank you for sharing your feedback on my tour. I appreciate all the support and hope to host you again in the future. Warmest Regards, Rui F.
Our family loved Rui's tour! He knew plenty of history and was very engaging. Someone in our group got sick during the tour, and he was very concerned for her and helped to get her back to the apartment. I would definitely recommend his tour to anyone visiting Lisbon! TOUR GUIDE RESPONSE: Dear James, Thank you for sharing your feedback on your tour. It was a pleasure hosting you and your family and I hope your sister improved in time to enjoy your stay in Lisbon. Warmest Regards, Rui F.
TOUR GUIDE RESPONSE: Dear Sandra, Thank you for rating your experience with me. I appreciate the support. Warmest Regards, Rui F.
Rui is extremely informed, very engaged, and fun to spend time with. We feel very fortunate we were able to spend a 8 hours with Rui seeing and learning about Lisbon, and finding local eating spots. TOUR GUIDE RESPONSE: Dear Keith, Thank you for sharing your feedback. It was a pleasure to host you and your brother and I look forward to hosting you again in the future. Warmest regards, Rui F.
Rui's perfect English, very precise vocabulary and immense knowledge of Portugal's history is indispensable to understand and enjoy a day in Sintra. TOUR GUIDE RESPONSE: Dear Hugh, Thank you for your kind words. I am thrilled you and your group enjoyed the tour and I hope to host you again in the future. Warmest Regards, Rui F.
Rui is very professional, incredibly knowledgeable about his country's history he will be the highlight of your trip to Portugal. In a perfect English, Rui will brilliantly communicate the love of his country and his town Lisboa. TOUR GUIDE RESPONSE: Dear Hugh, Thank you for your feedback on my Walking Tour. I am glad your group enjoyed the experience and I hope to host you again in the future! Warmest regards, Rui F.
TOUR GUIDE RESPONSE: Dear Heather, I would like to thank you for rating your tour. I am thrilled that you enjoyed the experience and I hope to host you again in the future! Warmest Regards, Rui F.
TOUR GUIDE RESPONSE: Dear Brian, I would like to thank you for rating my tour! I am glad you enjoyed it and I hope to host you again in the future. Warmest regards, Rui F.
Rui is a very good guide. His spanish is really good and he is a very good person. His tour is really interesting and he knows a lot of interesting facts about Lisbon and its surroundings. You won't regret taking his tour. TOUR GUIDE RESPONSE: Dear Roberto, I would like to thank you for sharing your feedback. Your kind words are very much appreciated and I do hope you will consider me again on any future travels to Portugal. Warmest Regards, Rui F.
Very interesting tour with Rui, totally recomended. You won't regret choosing this tour. It is a five star one. TOUR GUIDE RESPONSE: Dear Roberto, I would like to thank you for your feedback. I am glad you and your family enjoyed my tour and that you were happy with my Spanish. Warmest Regards, Rui F.
Rui is a highly knowledgeable and informative guide. There is so much to see and do in Lisbon and Rui tailored the experience to each of us. He is informative, funny and flexible! We truly enjoyed exploring the different areas of the city hearing local insights and suggestions. Rui added tour aspects that made the experience interesting to our twenty-four year old son discussing local street art and artists (appreciated this!). 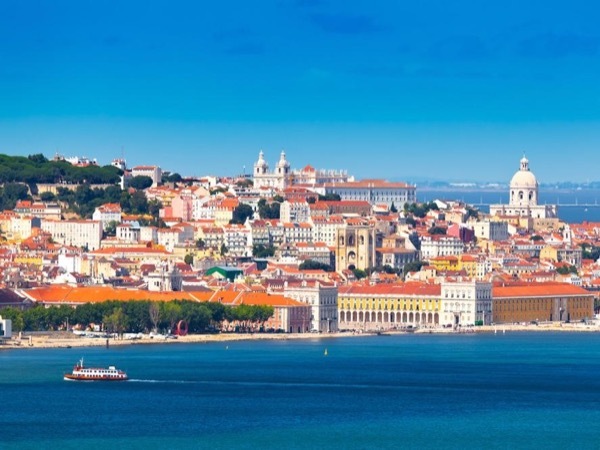 A tour with Rui will be the highlight of your trip to Lisbon! TOUR GUIDE RESPONSE: Dear Isaac, I would like to thank you for sharing your feedback. I am happy to say that I am thrilled you and your friends enjoyed the experience and I hope to host you again in the future. Warmest regards, Rui F.
Smart. Patient. Adapatable to my pace and interests. Very very good. TOUR GUIDE RESPONSE: Dear Brad, Thank you for sharing your feedback. I highly appreciate the kind words. It was a pleasure having you on my tour and I do hope you will consider me again in future travels to Portugal. Warmest Regards, Rui F.